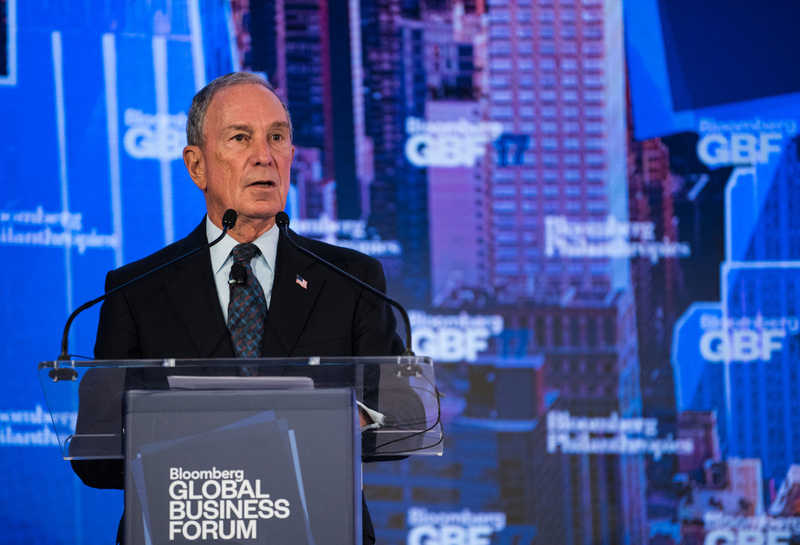 NEW YORK — Michael R. Bloomberg today announced the second Bloomberg Global Business Forum will be held in New York City on September 26th at the Plaza Hotel during the 73rd session of the United Nations General Assembly. Supported by Bloomberg Philanthropies, the daylong forum is the sole convening dedicated to encouraging presidents, prime ministers and CEOs to collaborate on trade issues by reaching a better understanding of one another’s challenges and mutual opportunities, thereby strengthening global economic prosperity. With protectionism on the rise – as well as worldwide population growth, economic inequality and climate change threats – it has never been more important for the world’s public and private sector leaders to uncover common goals and engage in economic diplomacy to promote continued globalization, innovation and competition. This one-of-a-kind forum will move beyond analysis and provide participants with the chance to shape the next stage of the global economy. The inaugural Bloomberg Global Business Forum held in September 2017 was attended by more than 50 heads of state and 250 global CEOs from all regions of the world including French President Emmanuel Macron, Canadian Prime Minister Justin Trudeau, Ghanaian President Nana Akufo-Addo, former U.S. President Bill Clinton, Apple Inc. CEO Tim Cook, Blackrock Co-founder Larry Fink, Microsoft Corp. Founder Bill Gates, Alibaba Founders Jack Ma and Lucy Peng, PepsiCo CEO Indra Nooyi, SoftBank CEO Masayoshi Son and many others. The Forum also served as the stage for several major announcements including announcements by World Bank President Jim Kim and UNFCCC Executive Secretary Patricia Espinosa Cantellano who joined Michael Bloomberg to announce a new initiative to ramp up finance for climate action; California Governor Edmund G. Brown Jr.’s announcement of the 2018 Global Climate Action Summit being held in San Francisco; Turkish President Recep Tayyip Erdoğan views on security for a region in flux; and discussions by European Commission Vice President Federica Mogherini, ENGIE CEO Isabelle Kocher and Econet Founder Strive Masiyiwa on climate change, mass migration and economic transformations. The 2018 Bloomberg Global Business Forum partners are Alphabet Inc./Google CFO Ruth Porat, BNP Paribas CEO Jean-Laurent Bonnafé, Credit Suisse CEO Tidjane Thiam, Dangote Group President/Chief Executive Aliko Dangote, Engie Global CEO Isabelle Kocher, EXOR Chairman and CEO John Elkann, LVMH Chairman and CEO Bernard Arnault, Mahindra Group Chairman Anand G. Mahindra, Misk Foundation Chairman and His Royal Highness Crown Prince of Saudi Arabia Mohammad bin Salman bin Abdulaziz, and SOHO China Founder and CEO Xin (Shynn) Zhang. Heads of state from five continents are already confirmed to attend this year’s Forum. Prominent attendees expected include United Nations Framework Convention on Climate Change Executive Secretary Patricia Espinosa Cantellano; Mark Carney, Governor of the Bank of England; Adriana Cisneros, CEO of Cisneros Group; Valdis Dombrovskis, Vice President for the European Commission; Roger Ferguson, President and CEO of TIAA-CREF; Dawn Fitzpatrick, CIO of Soros Fund Management; Ken Griffin, Founder and CEO of Citadel; former U.S. Secretary of State Henry Kissinger; Christine Lagarde, Managing Director of the International Monetary Fund; Bill McDermott, CEO of SAP; Nicholas Moore, Managing Director and Chief Executive Officer of Macquarie Group; South African President Cyril Ramaphosa; The Rt Hon Patricia Scotland QC, Commonwealth Secretary-General; Feike Sijbesma, Chairman and CEO of Royal DSM; Barry Sternlicht, Founder and CEO of Starwood Capital Group; Margrethe Vestager, European Commissioner for Competition; Alexa von Tobel, Founder and CEO of LearnVest; and Fernando Zóbel de Ayala, President and COO of Ayala Corporation. Recognizing that saving our planet in the race against global warming is a shared responsibility requiring cooperation between governments, leaders from the public and private sectors and civil society, French President Emmanuel Macron, Secretary-General of the United Nations António Guterres, President of the World Bank Group Jim Yong Kim and United Nations Special Envoy for Climate Action Michael Bloomberg will host the second One Planet Summit on the afternoon September 26th at the Plaza Hotel. They will convene key influencers to account for the implementation of commitments made at the inaugural One Planet event in December 2017, celebrate progress made and further engage public and private actors to raise ambition for multilateral climate action. The One Planet Summit will show how high-level institutional decision-makers as well as individual citizens can all work as one planet to deliver solutions to mitigate the effects of climate change and invent our collective future. According to a Bloomberg Global Business Forum-Morning Consult poll conducted online from June 22 – 24, 2018, among a national sample of 2,202 adults 18 years and older, support for free trade and expansion of trade across borders has risen significantly since September 2017 to 63 percent (up from 52 percent), while support for globalization has held mostly steady (up to 50 percent from 47 percent). Overall, the poll shows half of Americans (50 percent) feel that the global economy is on the wrong track compared to less than a third (30 percent) who say it is moving in the right direction. Americans are also “nervous” and “worried” about the potential for a trade war with China with 44 percent of people polled saying they think we are already in a trade war with China. The poll also shows that 46 percent of Americans believe U.S.-imposed tariffs on goods has a negative impact on consumers, versus 28 percent who say it has a positive impact. More people (44 percent) support imposing tariffs on foreign-made goods that compete with U.S.-made goods than oppose it (32 percent). Morning Consult is a leading survey research, media and technology company. More details of the Bloomberg Global Business Forum-Morning Consult poll can be found here. Additional details about the program will be announced in the coming months.